5. In the derivation of expression for peak percent overshoot, which one of the following conditions is NOT required? 6. A double integrator plant, G(s) = K/S2, H(s) = 1 is to be compensated to achieve the damping ratio ξ = 0.5, and an undamped natural frequency ωn = 5 rad/sec. Which one of the following compensator Gc(s) will be suitable? 12. Step response of a set of three second order under damped systems all have the same percentage overshoot. Which of the following diagrams represents the poles of the three systems? 13. Group – I lists a set of four transfer functions. Group – II gives a list of possible step responses y(t). 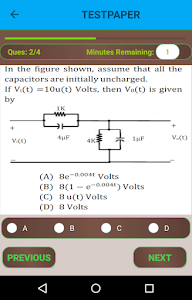 Match the step responses with the corresponding transfer functions. 14. A certain system has transfer function G(s) = (s + 8)/(s2 + αs – 4 ), where α is a parameter. Consider the standard negative unity feedback configuration shown below. 20. A system with transfer function is excited by sin(ωt). 21. Which one of the following is NOT TRUE for a continuous time causal and stable LTI system? 25. The open loop transfer function of a DC motor is given as ω(s)/Va(s) = 10/(1+10s). when connected in feedback as shown below. The 2% settling time of the step response is required to be less than 2 seconds. Which one of the following compensators C(s) achieves this? 2. The unit step response of an under damped second order system has steady state value of – 2. Which of the following transfer functions has these properties? 4. The position control of a DC servo-motor is given in the figure. The values of the parameters are KT = 1 N-mA, Ra = 1 ohm, La = 0.1 H, J = 5 kg-m2, B = 1 N-m/(rad/sec) and Kb = 1 volt/(rad/sec). The steady state position response(in radians) due to unit impulse disturbance torque Td is _______. Ẋ = AX + BU and Ẇ = CW + DU. The eigen values of the representations are also computed as |λ| and |μ|. Which one of the following statements is TRUE? 9. A signal flow graph of a system is given below. where p and q are arbitrary real numbers, which one of the following statements about the controllability of the system is TRUE? 13. The block diagram of a system with one input u and two outputs y1 and y2 is given below. 15. The signal flow graph for a system is given below. 17. A system is described by the following differential equation, where u(t) is the input to the system and y(t) is the output of the system. 18. consider the state space model of a system, as given below. 20. Consider the state space system expressed by the signal flow diagram shown in the figure.